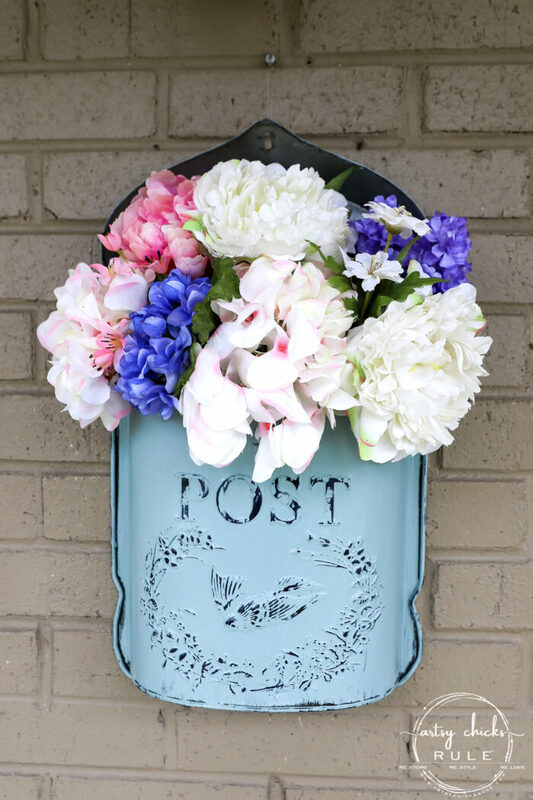 Unique vessels, like this antique mailbox, make the perfect accompaniment for spring flowers! 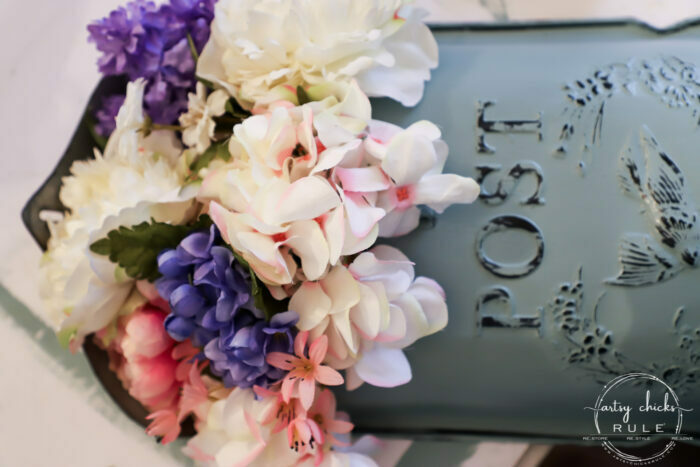 I am SO happy spring is here, so I’m sharing yet one more spring goodie today. I actually put it in my cart and considered buying it. BUT I had a bunch of other things in my cart and didn’t really have a plan for the mailbox at the time. So thrifty me put it back. Until last week when I came across one exactly like it (although a different color) at Marshall’s. Yippee! I had a plan for it this time. But it didn’t really matter if I didn’t, I wasn’t letting it get away. Here’s what it looked like when I found it…. A little much for cheapy me but oh well. It had to come home with me. Green is a great color for spring but it isn’t what I use much of so I knew I’d be painting it. 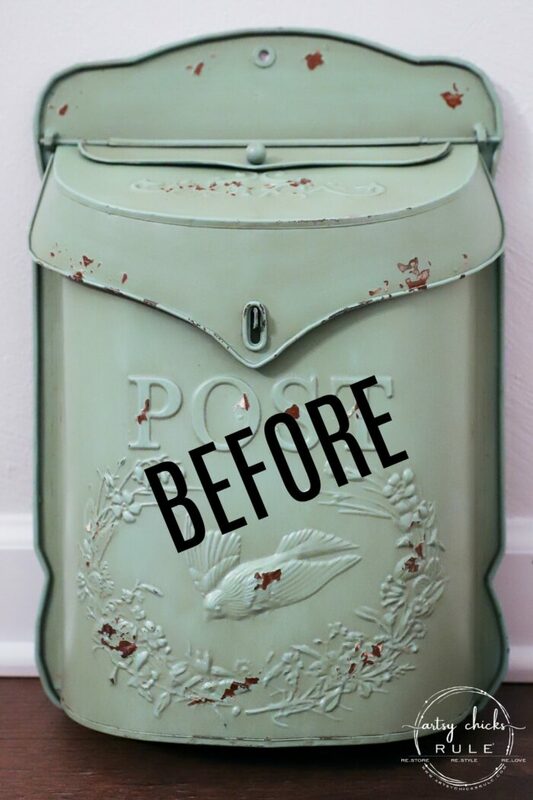 Plus, I wasn’t loving that faux rusted “distressed” look going on. So I gave it my own distressed look. 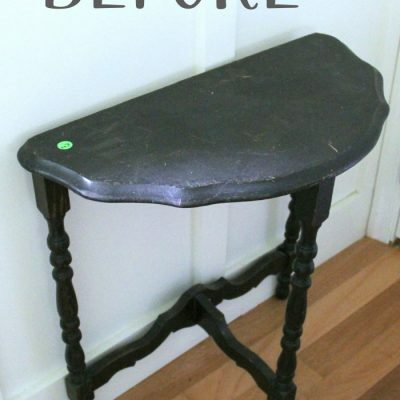 Starting out by painting it black…. I just used a basic black spray paint in Satin finish. 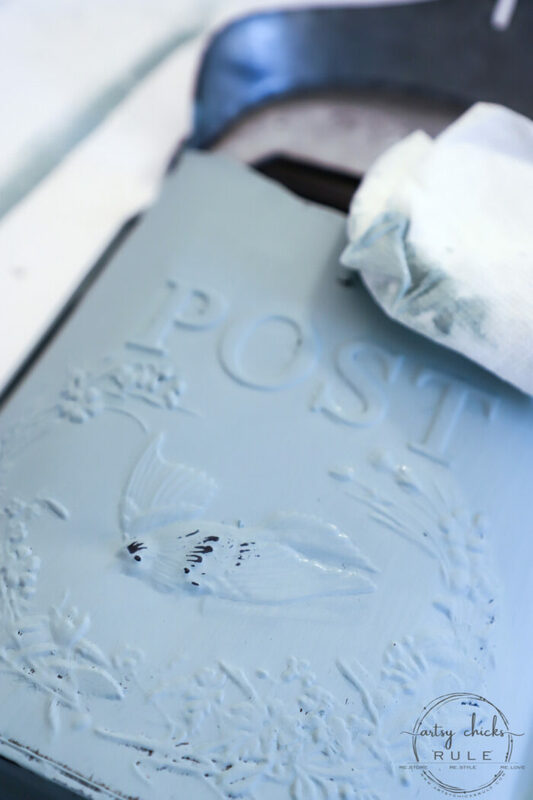 Once that was dry, I brushed on some Duck Egg Blue Chalk Paint with a chip brush. One thin coat is all that was needed. I didn’t want full coverage. Once that was dry, I went back over the high points, and anywhere else I wanted to remove paint, with a damp paper towel. 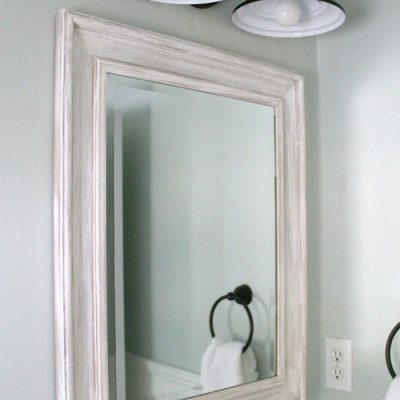 Spray painting with a semi-glossy finish beforehand makes it really easy to wipe away some of the paint. 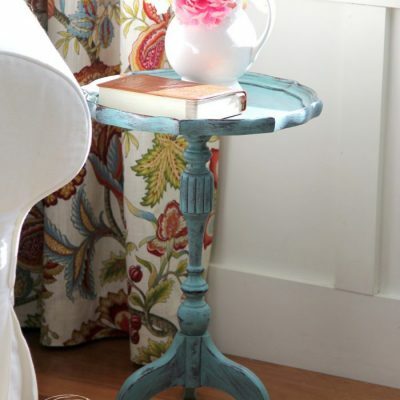 This is especially easy when using something like Chalk Paint or Milk Paint over regular latex or spray paint. Then I sealed it up with this top coat sealer. Next, I filled it up with colorful flowers. I thought about using all white but there’s just something about spring that says “colorful” to me. So I added all the colors in. I will probably change it to all white for the summer months. That, or just greenery. I just used what I had on hand leftover from other projects. I posted a sneak peek of this over in my Instagram stories as I was working on it. If you follow along with me over there, you might have seen it. I already had a screw screwed into our brick but it was a little high. So decided instead of adding another, I’d just hang it from the screw with fishing line. Our poor hall tree has seen some weather up here on the porch…and it’s now showing it. It’s actually done quite well until recently. It’s been out here for 6 years now. 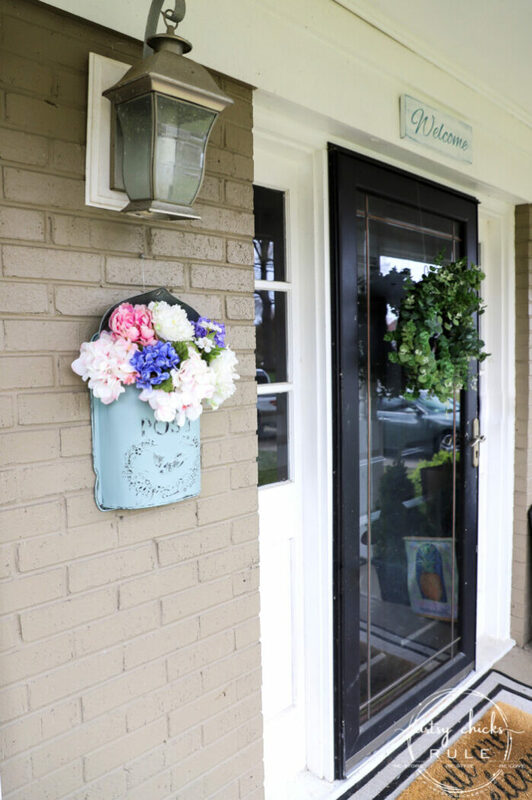 But it’s kind of like the rest of the front porch. All in need of a major overhaul. Which it’s getting in the next few months. So please look past the chipping paint and just overall “aged” appearance of it all. Our house is 40 years old. We painted out here when we moved in but it’s been 15 years, so it’s due for a touch up, re-do. 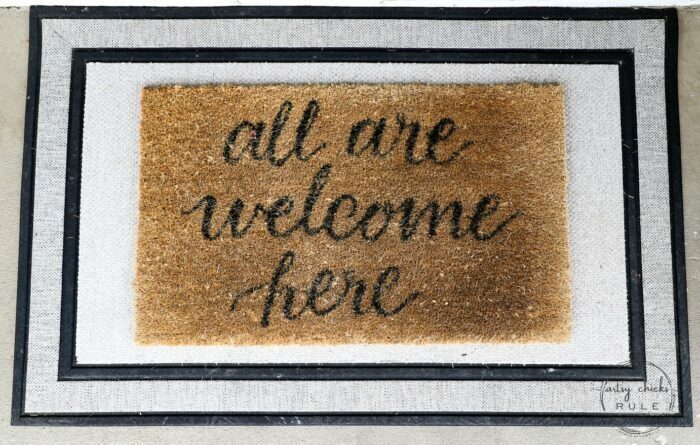 I love this sweet welcome mat I found a while back. You can find it >>> here. The black and gray mat underneath came from Lowe’s. 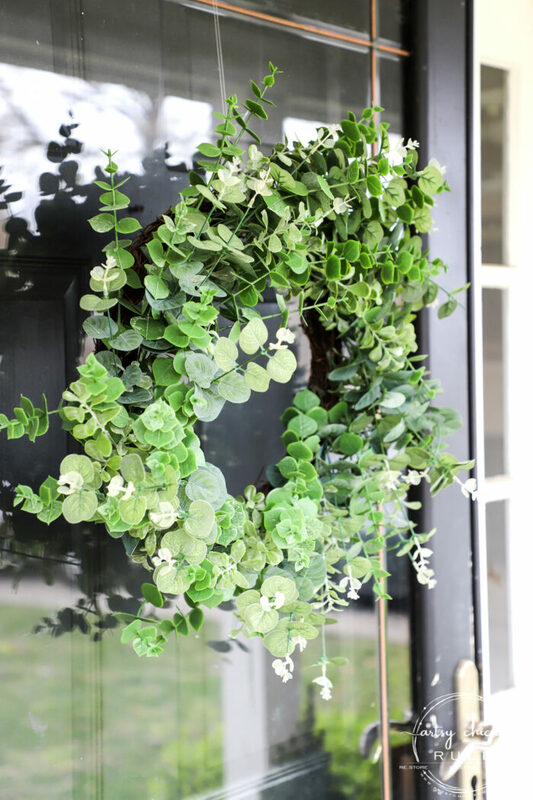 I’m loving this simple faux eucalyptus wreath I picked up at TJ Maxx a couple of weeks ago. 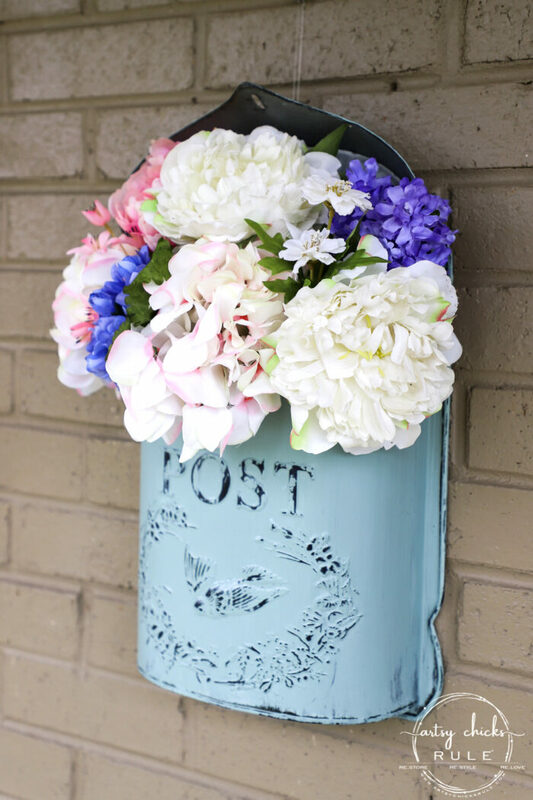 I’m so happy with how my sweet little antique mailbox floral arrangement turned out. 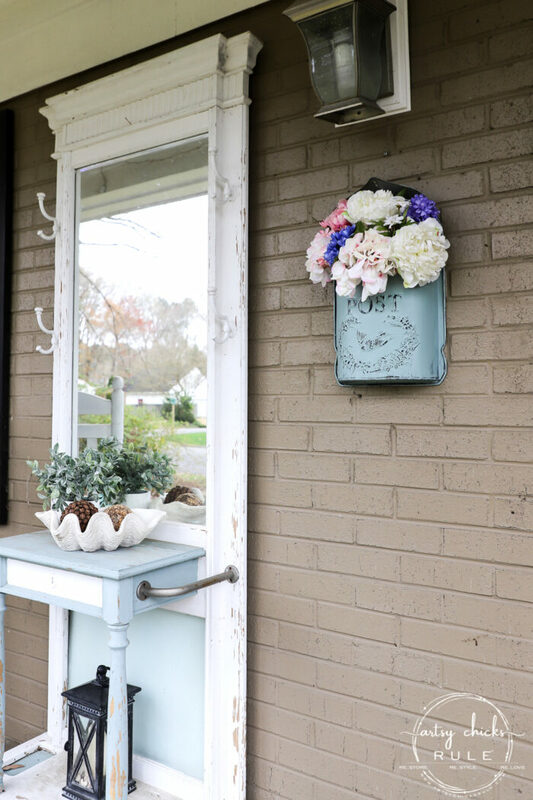 It looks so happy and is a nice addition to our porch. I hope you have a wonderful and blessed spring weekend! Completely adorable Nancy! Thank you for the brilliant tip of spraying with sealer before putting on the duck egg blue. 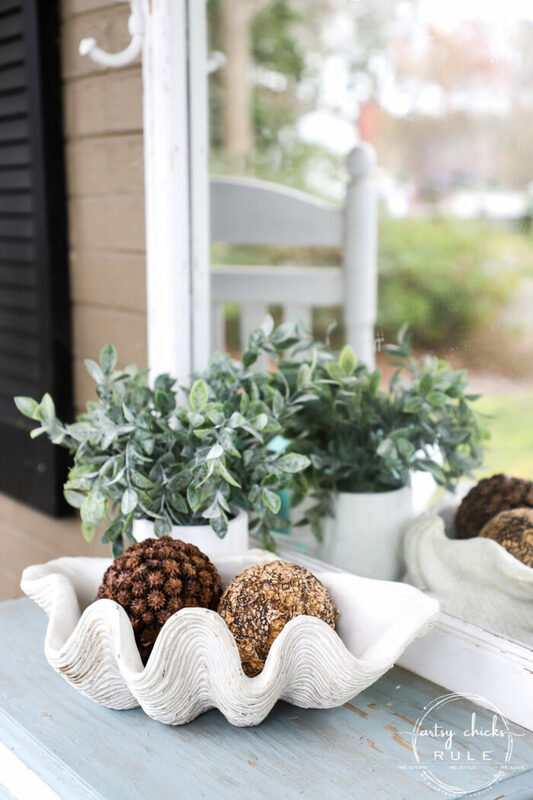 This looks great on your porch. Way to go!!! 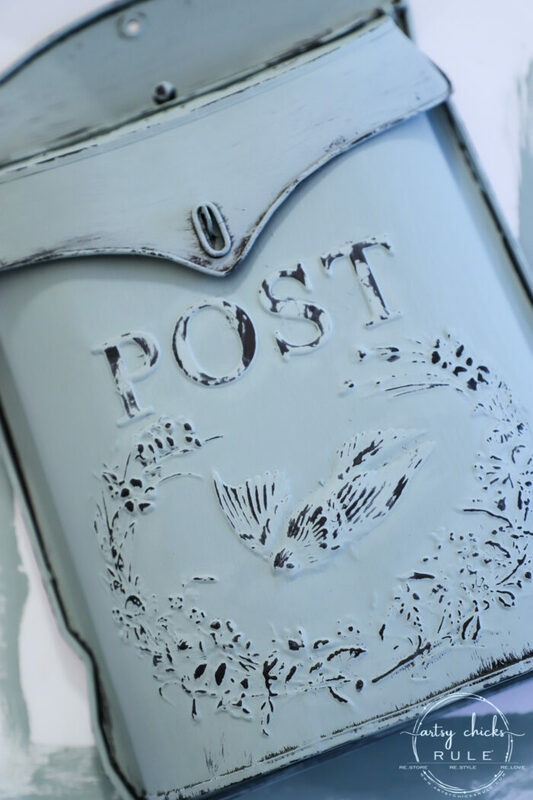 i love how the distressing really brings out the birdie – my thing! 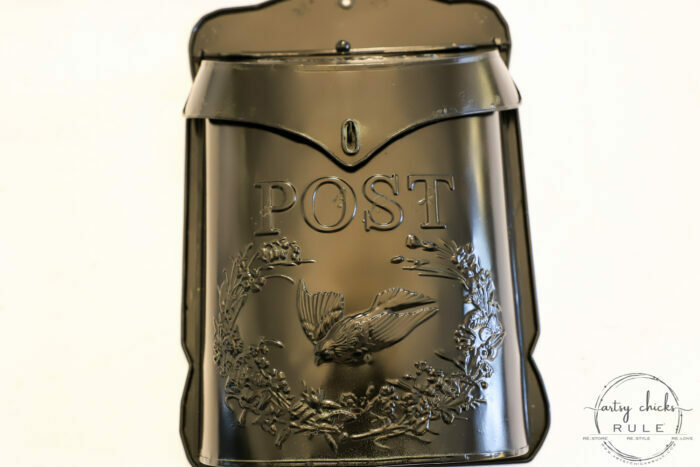 i just bought a vintage mailbox myself, but no bird on it – darn! 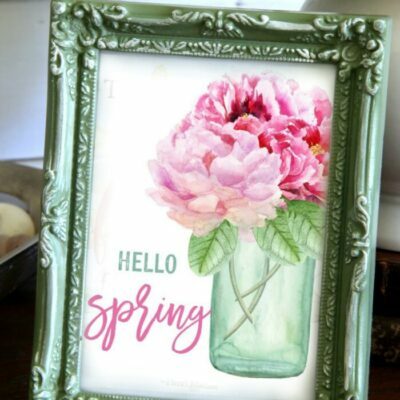 this one looks great on your porch and really says ” SPRING!” great job! 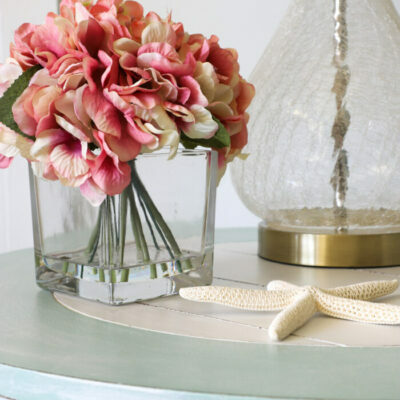 Do you have a good inexpensive place you get your flowers? I love it! 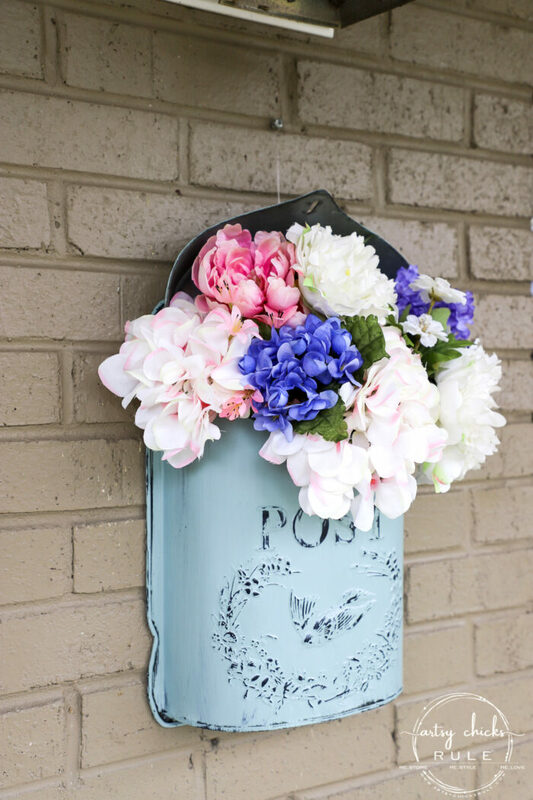 Such a cute display piece!! 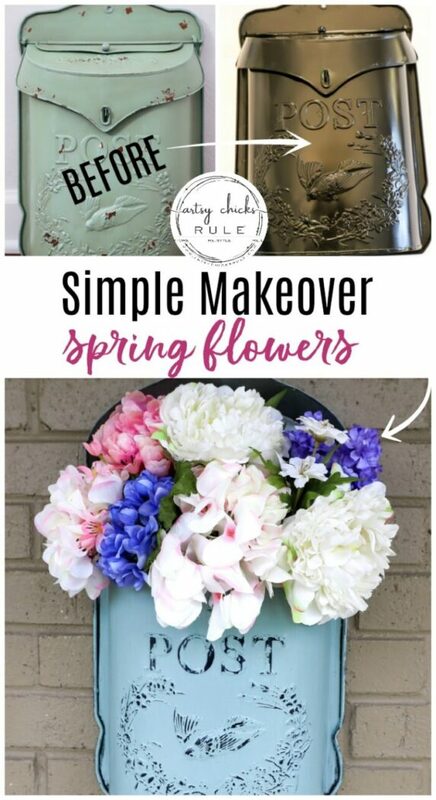 Love the easy projects sometimes! 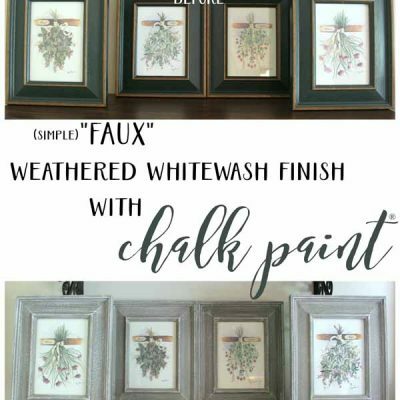 Good tip about the chalk paint over the spray paint. Thanks! 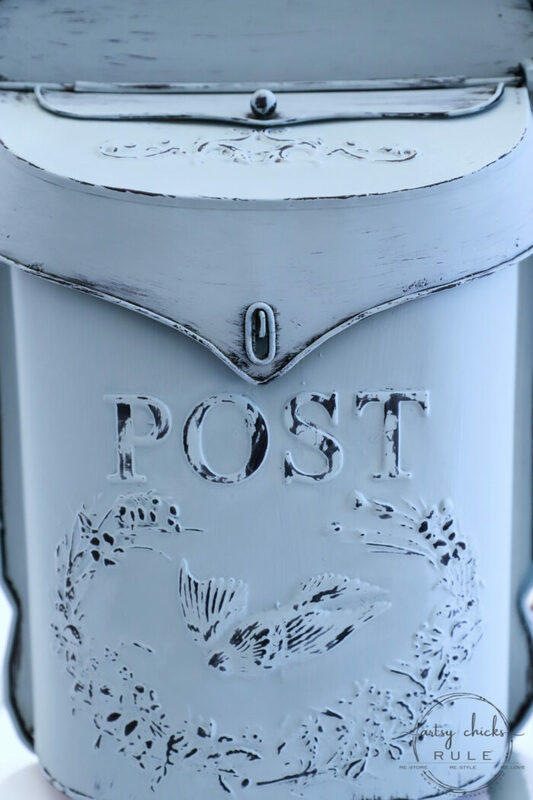 I’ve seen reproductions of this mailbox everywhere. That could work, too. Yours is very pretty. Great color. 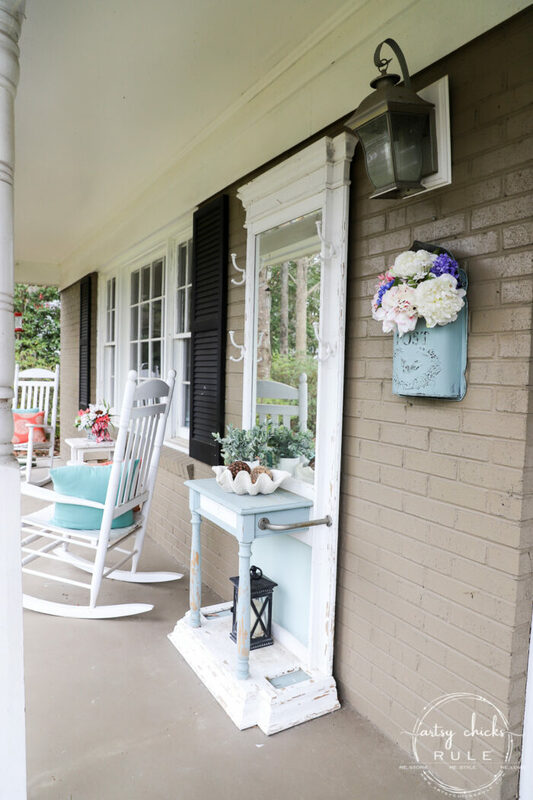 Such a sweet update, and your porch is charming Nancy! Nancy, I have a question. You mentioned that you painted it first in black satin finish. Then later it was mentioned that after chalk painting, you rubbed some off with damp cloth, and that it makes it easier after painting with semi-gloss. So is the black paint satin finish or semi-gloss? 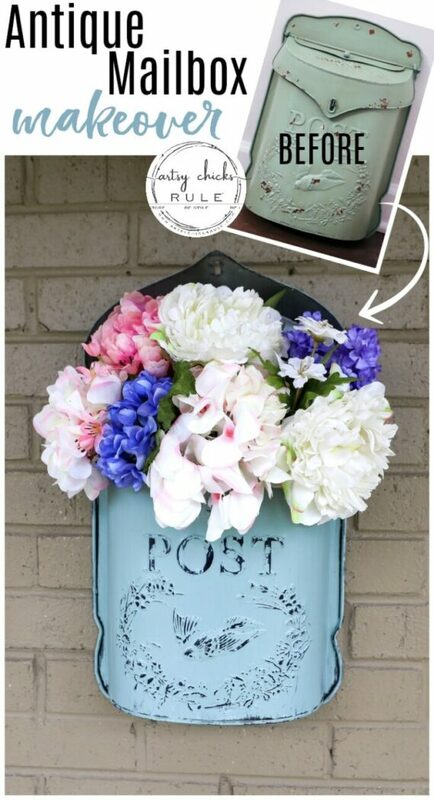 Just confused and thought I’d check before doing this to my mailbox. 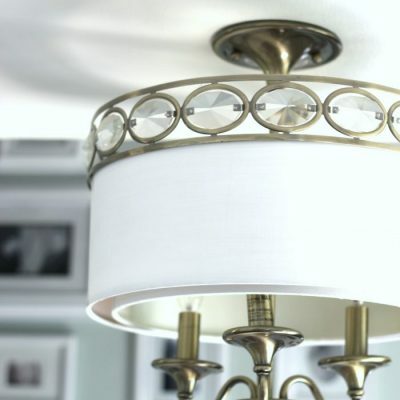 You did a great job–really looks great!